Holley's tall LS valve covers are the latest addition to our extensive line of LS engine components that will add a custom touch to your engine bay and help you to stand out from the crowd. These valve covers were designed to add an additional 0.54" of internal clearance over factory height valve covers. The valve covers retain Holley's signature integrated angled coil mounts, and the hi-tech look and performance of coil-on-cover applications. The Holley tall LS valve covers fit LS1, LS2, LS3, LS6 and LS7 engines using coils with a standard LS3 bolt spacing of 72mm. These valve covers come ready for installation with an OE style baffle and ventilation system, lengthened factory style mounting hardware, plus a billet aluminum oil fill cap. Angled coil mounts deliver a smooth clean look. Retain the high-tech look and performance of “coil on cover”. Eliminates unsightly OE style coil brackets. Billet aluminum oil fill cap. Reuses original gaskets and bolts. Fits all LS engines using LS1, LS2, LS3, LS6 and LS7 or similar coils with spacing 72mm bolt spacing. 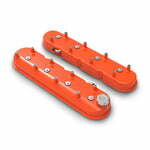 Designed to add an additional 0.54" of internal clearance over factory height valve covers. Holley’s LS covers use proven OE style baffles and vents. Fits LS1 LS2 LS3 LS6 LS7 engines. Holley Performance Products, Inc. products are warranted to be free from defects in material and workmanship for a period of 90 days from the date of purchase, except Avenger series carburetors, which carry a lifetime warranty on parts and a one-year warranty on labor. Any Holley deep cell battery also carries a one-year warranty. For select carburetors and superchargers, there will be a core charge. If the part qualifies, there will be a letter and a call tag included in the box from Holley. The part must be returned to Holly, and if it is in acceptable condition, Holly will issue credit directly to the customer. In addition, Holley Performance Products, Inc.'s limited warranty specifically does not apply to products which have been modified or altered in any way, subjected to adverse conditions such as misuse, neglect, accident, improper installation or adjustment, dirt or other contaminants, water, corrosion or faulty repair, or used in applications other than those recommended by Holley Performance Products, Inc. This warranty does not warrant and disclaims all liability for products used in racing activities and/or applications, other than those specifically recommended by Holley Performance Products, Inc.